Is «Bubble tea» to Tea what «American coffee» is to Coffee? 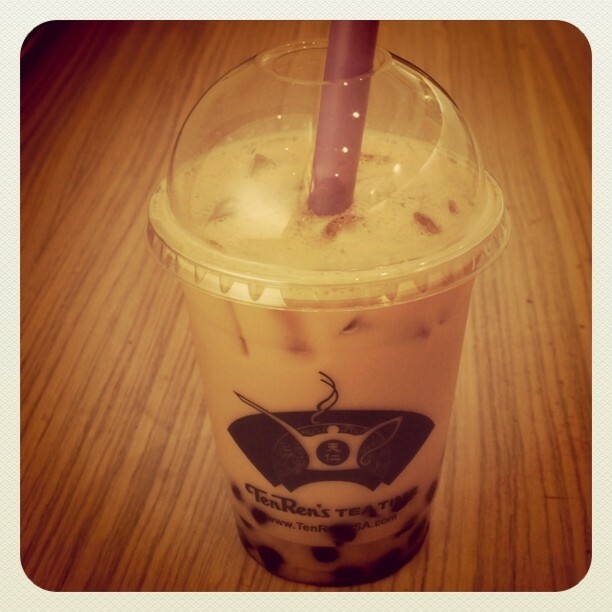 Black Milk Tea with Tapioca Bubbles at Ten Ren, Chinatown New York. It has been some time now since I’ve been in and off New York City. The first time I noticed these drinks, I was in Flushing, Queens. I was wondering…. What is that? For every 4 people in the crowd streets was holding one of those? 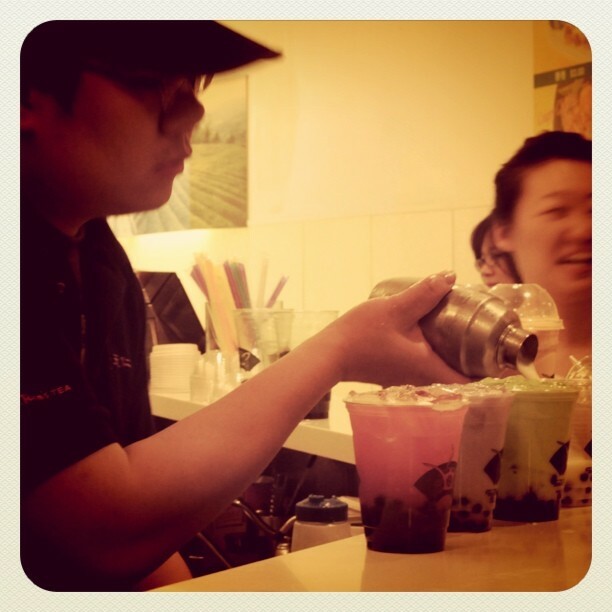 It took me a while to associate the name I’ve heard a lot before:”Bubble Tea” with actually that drink I saw in Flushing. And I took me about 6 months or a year from first time noticing it and then actually trying it. A lot of “unexpected” things happened to me in New York City, actually I can blame the city … Things like drinking coffee, and drinking Bubble tea as well. These two things are not diluting my actual respect for “real tea”, but they are part of city life. 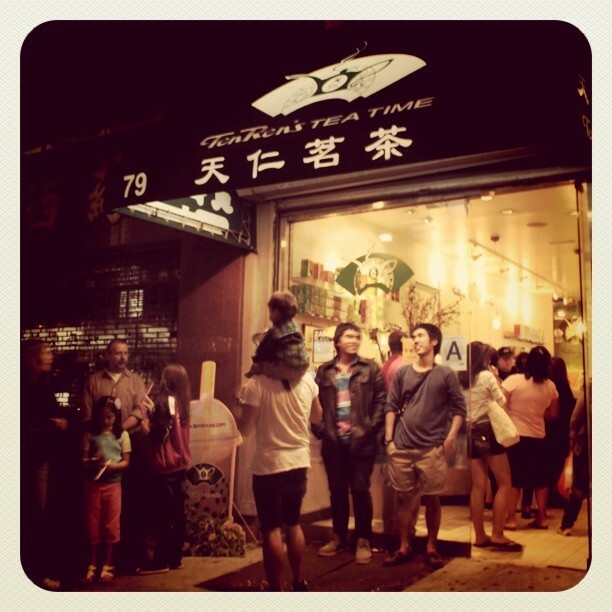 Ten Ren has 2 Stores on Mott St., Chinatown. The one selling Bubble tea is open til 10 or 11pm. It was super crowded, but it was a Saturday Evening. The staff was efficient and nice. On their menu they have like 13 choices of “Tapioca Traditional Iced Tea”, 14 for Tapioca Fruit Tea, they add either Green or Black tea but without milk. They also have around 12 flavors for Tapioca Iced Milk Drinks, and about 15 Tapioca Shredded Ice drinks. They also serve Hot tea there, but not sure it’s as popular as their Bubble teas. I don’t know about you, but even if having many choices sounds good, for me it’s a nightmare…I guess it’s a “girl thing”, we’re not always good at choosing something. So today, I just tried the basic Black Milk Tea. These guys are trained, they’re efficient so that people don’t wait. Because people line up non-stop. I have never seen that in Europe, I’ve been in Paris & London Chinatowns though. If anyone from Europe has seen that there, feel free to comment. It’s still a curiosity to me. Yes, it’s true. The Thai Iced Tea seems to be a sort of classic. It’s tapioca. Also called “bobba”. That’s why they call it “bubble tea” 🙂 It’s usually pretty sweet. Like a Beginner, I am always doing a search online for articles that can assist me.